FREE 2 DAY SHIPPING to Lower 48 states - Half price Ground to Canada. MagnaFlow's Performance Exhaust systems are rugged, reliable, built to last, and their legendary straight-through, wide-open, stainless steel mufflers provide the smooth, deep tone they are famous for. These exhaust kits and cat-back systems feature mandrel bends to ensure there are no flow restrictions and OEM-style barbed hangers for easy installation. All of MagnaFlow's exhaust systems are factory-checked for proper fit and dyno-tested to verify performance gains. All necessary installation hardware is included and the entire system is backed by MagnaFlow's lifetime warranty. PFYC is an Authorized Retailer of MagnaFlow products. MagnaFlow's Lifetime Warranty will only be honored on product purchased through an Authorized Retailer. Nothing performs better, looks better, or sounds better than MagnaFlow Performance Exhaust. The MagnaFlow Research and Development Team invests many hours to ensure their products stay competitive and perform the way they should. MagnaFlow systems feature straight-through flow designs for the ultimate in unrestricted horsepower and torque for big power while maintaining exhaust efficiency. 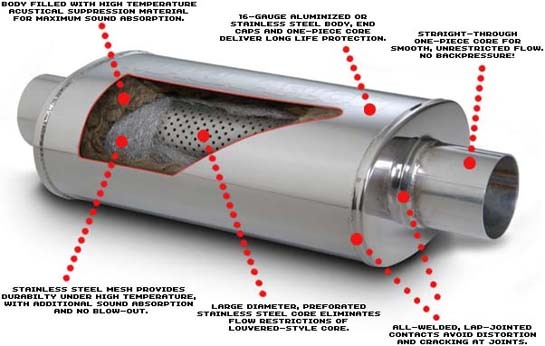 The internal MagnaFlow muffler is designed of stainless steel perforated core, stainless steel wool, and an acoustical absorbent material -- superior to fiberglass (which many other manufacturers use). No baffles, chambers, or louvers. No restrictions at all, just straight-through, wide-open performance with a smooth, deep tone, and each MagnaFlow stainless muffler has a highly polished mirror finish for a show car look. Our systems give a 20% reduction in bends over your O.E.M. system to provide the power you demand.